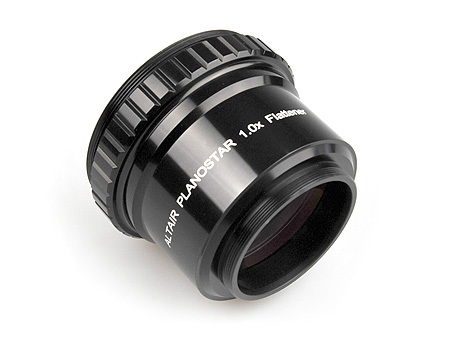 This field flattener is designed to work with the Altair Astro 80mm F6 Super ED Triplet APO, and has an M48 rear thread adapter for connecting your DSLR or CCD camera. All triplet refractor lens systems with good colour correction exhibit some natural field curvature which, while not relevant for visual observation, can be visible in astro-images. This field flattener screws directly into the rear focuser rotator of your Altair 80mm F6 ED triplet APO, converting it into an astrograph with a flatter photographic field than a triplet lens system alone. It does not change the focal length of the telescope significantly enough to affect subject framing. The ideal distance to CCD sensor from the rear of the conical adapter flat shoulder excluding the M48 thread is 54.7mm.